The movie is due out on November 2. Amy Winehouse producer Salaam Remi discusses the recording of the late singer's "Tears Dry On Their Own" in a new clip from the upcoming documentary, Back To Black. 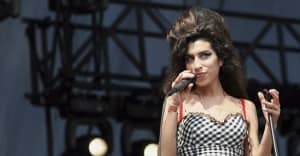 The film goes behind the scenes on Winehouse's 2006 album, detailing the recording process and the impact it made around the world. Back To Black will be available on DVD and on demand from November 2. Thumbnail image courtesy of Dan Kitwood/Getty.